Murphy beds and small table surfaces aren’t the only interior elements that can pop out of walls or freestanding cabinets to offer extra function when it’s needed. Entire kitchens, living rooms, bedrooms, offices, play areas and even balconies can be unfolded or pulled from nearly-flat surfaces to make small spaces more versatile, shifting their purpose altogether within minutes. 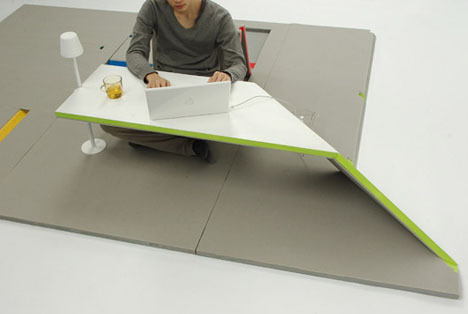 See 12 more ultra-compact fold-out room systems. 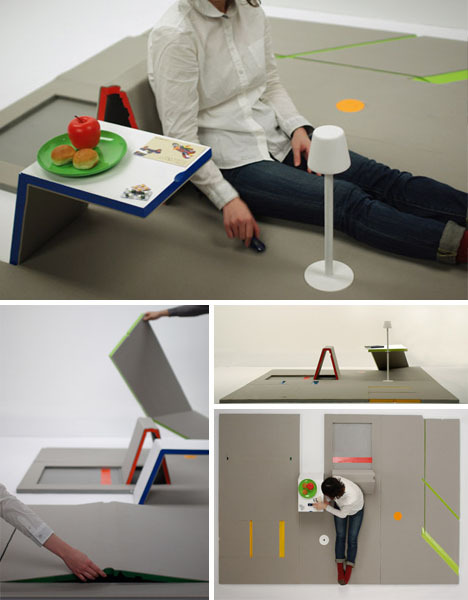 Entitled ‘Land Peel,’ this piece by Shin Yamashita is a flat floor mat with elements that pop up to create a variety of seating and working/eating surfaces. Small living spaces rarely have enough room for an entire children’s play area, but fold-away solutions create one when it’s needed. My Space by Liya Mairson packs almost entirely flat when not in use, but pops up into a fun little private play space within minutes. Since it’s made of cardboard, it’s light enough for kids to set up themselves. 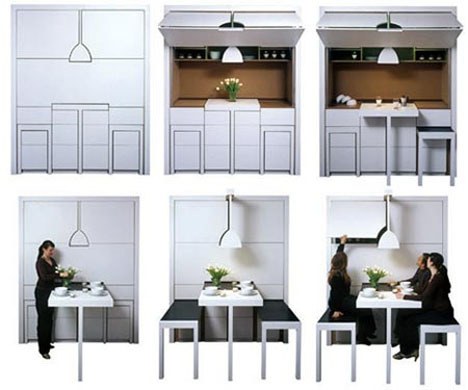 Bench seating, a dining table, and even an overhead light pull out of this compact pull-out dining room design, which also contains storage space. 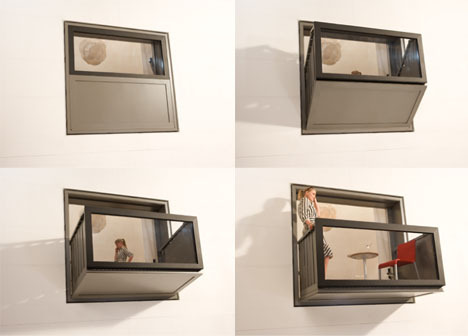 Get access to the outdoors from an upper-level apartment or condo in under a minute with this cool pop-out balcony by Hofman Dujardin Architects. It looks like a window when closed, but opens up to offer a small but valuable temporary outdoor space.